Lack of self-control has shocking consequences, but inventiveness carries the day in a contemporary fairy tale from Newbery Medalist Nancy Willard, with art by Kevin Hawkes. 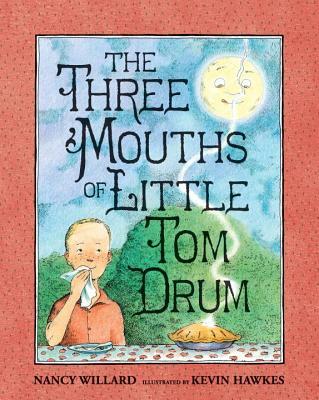 Little Tom Drum loves strawberry pie so much that he creeps down to the kitchen at night to get one more slice of that sweet, flaky goodness resting on the windowsill in the moonlight ... pie his mother made for tomorrow's birthday party. If only he had thought twice! Bearing the marks of his greediness, Tom Drum resigns himself to a reclusive life, but soon gains fame as a child inventor. Can his imagination and ingenuity lead to his own reinvention? Kevin Hawkes's comical illustrations, brimming with creativity, add to the fantastic and the cautionary in this original fairy tale by award-winning poet Nancy Willard.